Romaine has outpaced iceberg lettuce in popularity with consumers. The extra nutrients it offers are popular with more health-conscious consumers. Appeal to those shoppers in your marketing of romaine. Romaine’s health benefits are a big draw for consumers. Romaine contains vitamin A, which is essential for healthy eyes. The folate found in romaine can help prevent neural tube birth defects. Romaine is a good source of potassium, which has been shown to help lower blood pressure. The vitamin C in romaine can help keep your immune system working well and help prevent cancer. 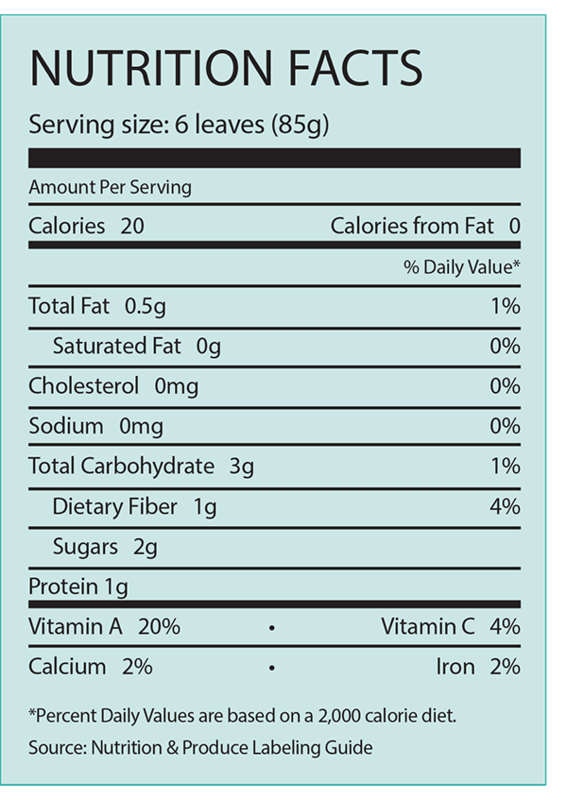 The U.S. Food and Drug Administration has approved the following nutrient content descriptors for romaine: low-fat, saturated fat-free, sodium-free, cholesterol-free, low in calories, high in vitamin A and a good source of folate. After falling in 2016, retail sales increased nearly 7% in 2017. Volume grew 4.5% and per-pound retail prices increased 2.5%. Besides being the base for Caesar salad, romaine can also be used as a topping for sandwiches and in other types of salads. Cross-merchandise it with croutons, salad dressing, salad toppings, deli meat and cheese. Romaine is available year-round, so take advantage and promote it throughout the year. Fall: Include romaine in football game-day promotions as a topping for tailgate burgers. Winter: Promote romaine as a base for holiday salads. Encourage consumers to think about adding a Caesar salad to their holiday table. Spring: Create an Ides of March display to play up romaine’s association with Caesar salad. Include it in Cinco de Mayo promotions as an alternative to iceberg lettuce in Mexican dishes. Summer: Promote romaine as an important piece of summer grilling promotions as a topping for grilled hamburgers or chicken sandwiches. Offer a salad promotion that lets consumers choose three salad items for the same price. Include romaine as one of the options. Be aware that there are two types of romaine. Self-closing romaine has leaves that curve inward at the tips to form well-blanched closed heads. Loose closing includes varieties that do not form closed heads, with leaves that appear coarse but are actually tender, sweet and less bitter than other varieties. Romaine can be displayed vertically, which creates an opportunity to draw a shopper’s eye. Stacking romaine heads vertically also helps keep the bottom heads from being crushed. Place romaine near other salad vegetables. Displaying romaine next to carrots or tomatoes creates an eye-catching color contrast. Romaine hearts are popular with consumers who just want the tender leaves near the middle, so include them in your display. Use romaine as a topping for sandwiches from chicken to hamburger. Romaine leaves are perfect to use as lettuce wraps for carb-conscious consumers. Offer romaine in a Caesar salad, but also use it as a base for other salads. Consider adding romaine to salad bars. Use a single romaine leaf as an attractive plate garnish. To crisp romaine, plunge the leaves in ice water for a few minutes just before serving. Temperature: 32 F (0 C) (Romaine will freeze if placed directly on ice or subjected to temperatures below this. If using ice in a display, place it on the sides and not on the product.) Relative humidity: 95% Mist: lightly Typical shelf life: 14 to 21 days Romaine does not maintain top quality when stored for extended periods.